When it comes to parking at the Miami Port, you have several options Prices fall according to convenience. So, the most convenient parking lot is also the most expensive. There are some differences in amenities that are worth looking into if you want to save a little money. Let’s begin with the Port of Miami’s official parking, then check out some of the others.  Heading to the port a night before embarkation ? 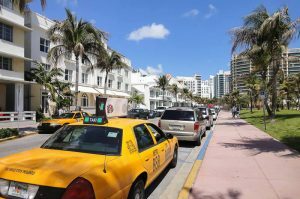 Check out our the best hotels with (free) parking for the duration of your cruise, and Miami hotels that offer free cruise port shuttle. One of the great things about cruises is that just about everything is taken care of for you. Getting to the cruise ship involves some decision-making. Hopefully, this quick overview of the surrounding parking options will help make at one of those decisions a little easier. The Port of Miami Offers onsite parking at all of its cruise terminals. This is the most convenient cruise parking available because of the proximity to the cruise terminals. Security patrols the lots as well, which is an added benefit. And, you have a choice between a covered parking garage and open lots. The Port of Miami lots are among the most expensive. Convenience is a big reason for the high price. That alone can be worth paying extra. They do have a good reputation, and the security presence is constant. There is a complimentary shuttle that will take you from the any of the parking lots to your cruise terminal. Parking is available for oversized vehicles, such as oversized vans, recreational vehicles, and vehicles with attached trailers. 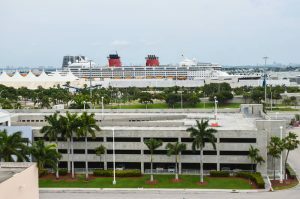 You can park your oversized vehicle only park in Lot #2, which is across from Cruise Terminal E.
Any vehicle longer than 20 feet is considered oversized. Note that there is an extra cost of $22 associated with this. Designated disabled permit parking spaces are available in each garage. Per Miami-Dade County Ordinance, all guests with a disabled parking permit or license tag pay the same parking rates as everyone else. Though, the Port of Miami will provide two hours of complimentary parking to vehicles with a disabled parking permit or tag. If you have someone picking you up from your cruise, there are 2 cell phone waiting lots. You can find the waiting lots across from Terminal B and Terminal 2. The general rate for overnight parking is $22* per day. The short-term parking rate is $8*. As mentioned before, there is an extra $22* per day for vehicles more than 20 feet long. They accept both cash, all the major credit cards, and any major U.S. Traveler’s Check. Though, note that they do not accept debit cards. All Port of Miami garages and Lot #2 are open on cruise days only. Parking attendants are stationed there from 6:00 a.m. to 5:00 p.m.
Garage J is a pre-paid garage only. You can pay upon arrival to Garage J, where you will receive a decal to post in your vehicle. This will identify it for the duration of your cruise. If you need to access the parking garage on a non-cruise day, you will have to contact PortMiami Cruise Operations or Port Security. Premier Cruise Parking offers several levels of covered parking on its lots. You can park your car in a garage and keep it out of the Miami sun. The Premier Cruise Parking garage is about two miles from the port. They offer a free shuttle to and from the cruise terminals. Rates are approximately $10* to $11* per day (includes access and service fees) for a one-week cruise, and about $9* per day for a two-week cruise. Note that no oversize vehicles are allowed in these lots. You can make advanced reservations on their website. Safe Cruise Parking has decent rates and a fenced and gated lot. It also has round the clock security. The lot is located about three miles from the cruise terminals. 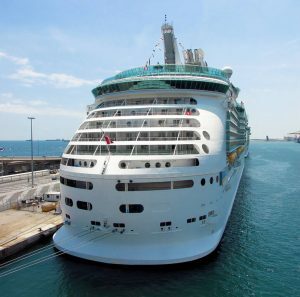 Safe Cruise Parking pride themselves on customer service and offer complimentary luggage assistance. They also offer a complimentary shuttle that makes regular runs to and from the Miami port terminal. The parking rate is about $10* per day, which is half what the Port of Miami charges. There is an additional fee for oversized vehicles. You can make advanced reservations on their website, so you are sure to have a spot waiting for you when you arrive. Miami Quick Park is located only a block away from Miami International Airport and within easy reach of the port. They have 400 outdoor parking spaces (no parking garage) and a large air-conditioned lounge. Staff is there to assist you with your luggage. They also have a complimentary shuttle to take you to your passenger terminal as well as one to and from the airport. 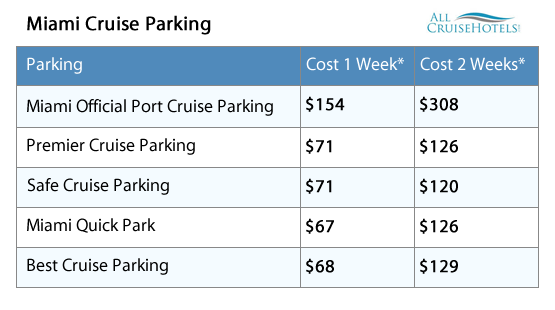 The parking rate for cruise parking is $7.95* (+tax) per day. To check in, go to the lounge and provide a representative with your credit card and license plate number. You can also book a reservation online through their website. Best Cruise Parking is at 2451 NW 7th Ave. There is limited valet parking available. You park your own vehicle and then check in with an attendant. You can book a reservation online through their website. The rates are about $9.75* per day. That includes up to four seats on their shuttle. More than four seats are additional. Prices vary depending on the number. note (*): Prices and parking rates listed are subject to change and may change at any time. Please contact the parking facility directly for latest parking rates.